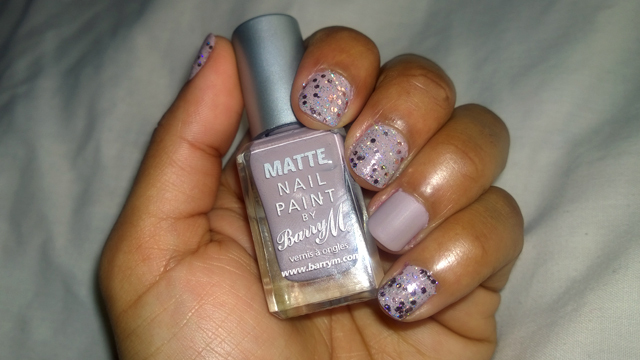 As part of my mission to have a sparkly Christmas, I bought Barry M Nail Paint in Rose Quartz. It’s a very pretty pale rose glitter nail polish consisting of rose gold micro glitter and rose gold hexagonal chunks. I have decided that this year I would wear glitter as a top coat instead of layering it for speed of both application and removal. I therefore went back to the shop for a pale pink base colour. Once there I decided that pale pink wasn’t quite right so I picked up Barry M Matte Nail Paint in Vanilla, a pale matte lilac shade. I already have the Barry M Matte Nail Paint in Caramel so I knew I would love the effect. I wasn’t disappointed! Rose Quartz and Matte Vanilla go perfectly together! I went for one coat of each with a clear topcoat except my ring finger on which I applied two coats of Vanilla followed by matte topcoat. Rose Quartz is fairly easy to apply and you will get some large glitter and lots of micro glitter with one sweep but to get a more even coverage of large glitter you’ll need to do a little bit of dabbing. 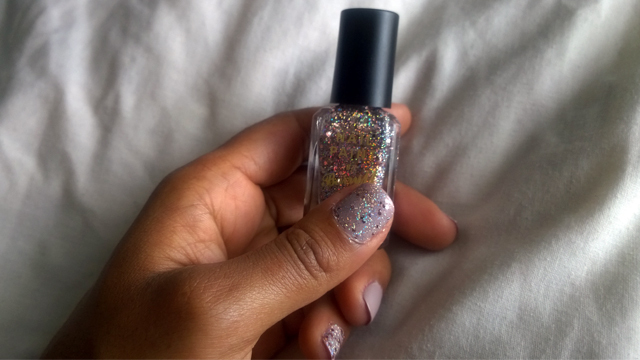 Although I bought Barry M Nail Paint in Rose Quartz for Christmas, I think it is the perfect New Year’s Eve glitter. I would wear Barry M Matte Nail Paint in Vanilla all year and it is already one of my favourites!